In the 21st century, the meme has been a main drivers of content online. Often born out of the darker places of the web like 4chan or news sites like Reddit, the meme can be a force to be reckoned with. Famous ones you may or may not have heard of include: Dancing Baby, O RLY, LOLCats, and the Star Wars Kid. If you haven’t heard of these, a VERY short google search will lead you to hours, or at least seconds, of time wasted. Why are we talking about memes at Catavino? Well we are fortunate to be at the virtual crossroads of a meme that was born in Spain which has bled over to the world of wine. Earlier this year, it was exposed that Cecilia Gimenez, a self proclaimed amateur art restorer, had the idea to fix a 19-century painting belonging to a Spanish church in Borja. The mural, Elías García Martínez’s Ecce Homo, was by many accounts ruined in the process. But like any great debate, some felt the restoration to be miraculous. So why are we telling you this? A Spanish winery (or two) decided to take advantage of the moment to release an Ecce Homo wine, made from 100% Garnacha. Having bought a bottle recently, I can honestly say a very inoffensive and quaffable fruit filled wine: perfect for parties, and pizza night, with the wife. Bodegas Ruberte was selling the wine directly from the winery at 10 euros a bottle. A one off, fun wine that hoped to capitalize on a moment. From our part, we love the idea. The wine showed an awareness of the world outside of wine, something wineries should do more often. Also I love the idea of wine as a product that is not always tied to long histories. I don’t think this wine has a long future, but for the time being, order a pizza, grab a bottle and have a laugh! But then we discovered that they were not the only ones who wanted to capitalize on an opportunity. Bodegas Aragonesas, known for Coto de Hayas, appears to launch 2 wines with the Ecce Homo label; and it appears that the registering of the trademark “Ecce Homo” for a wine brand was achieved by Aragonesas only hours not hours before Ruberte applied. 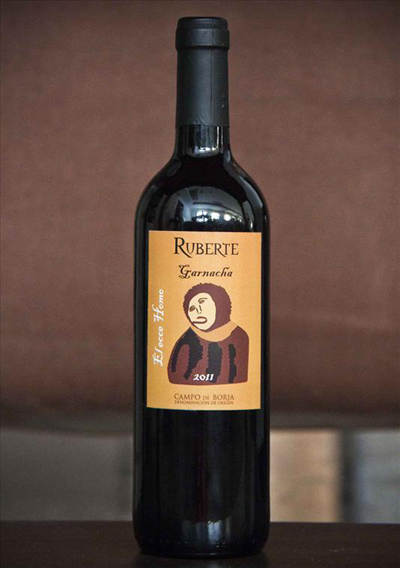 According to the articles we stumbled across, Ruberte has had to remove the sale of the wine from their site, meaning we now have a collector’s item in our house. Both wineries are located in Campo de Borja and the trademark “Ecce Homo” is now registered to Aragonesas for use on their wines. They are currently offering 2 wines, primarily made from Garnacha, of which all profits will be given to a local charity focused on the current labor crisis. Needless to say, I don’t think poor Cecilia could have expected that not only would her work win the hearts of the intenet, but also start a branding battle over her humble attempts to restore a forgotten painting. 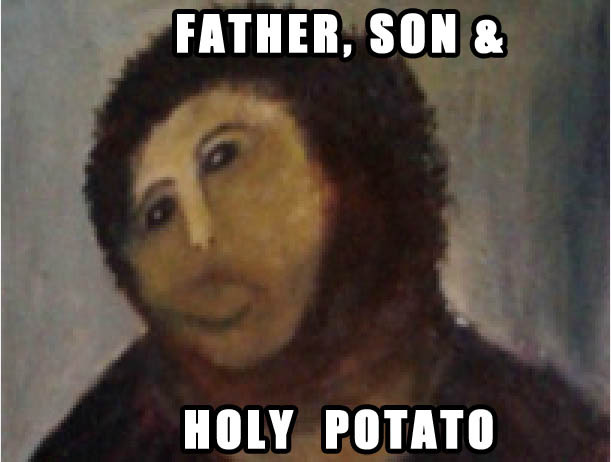 We’ll do our best to find the Argonesas wines, but for now, celebrate the meme! And heck, if you can’t get a bottle of Ecce Homo (either brand) go out and buy some Garnacha to enjoy while watching the video below!